TEL AVIV (Bloomberg) - It is Thursday night and Tel Aviv is hopping. Diners are lining up outside of Port Said restaurant; the sidewalk is filled with drinkers. It is a similar story nearby at Santa Katarina. If you have not booked a table, good luck. Across town at the Salon, it is even more lively. The dining room is jammed and the terrace is packed with people smoking, chatting on their phones or waiting for a table. Many are doing all three. Despite the spectre of confrontation as Iran entrenches itself near Israel's border with Syria, Israelis are partying like they are on top of the world. And with good reason. Tourism is booming-the number of visitors last year soared 22 per cent to a record and is rising even more quickly in 2018. The economy is healthy, unemployment is low and inflation almost non-existent. 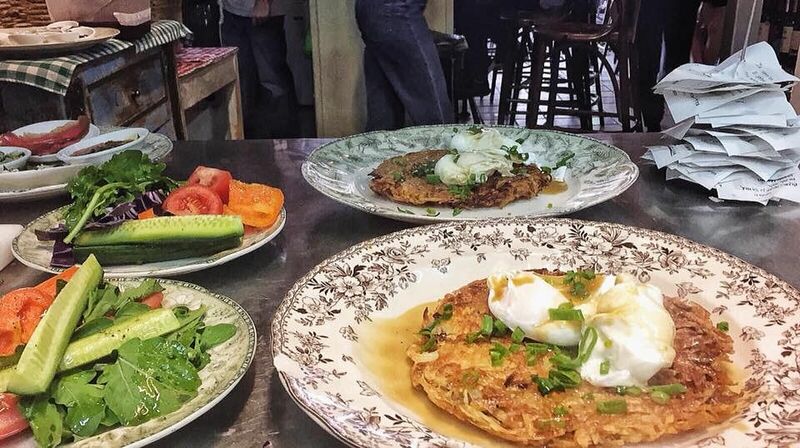 Israel has one of the most exciting dining scenes in the world, and it is just starting to be discovered as a food destination like New York or London. Restaurateurs in Tel Aviv say as many as 30 per cent of their guests are now foreign visitors, led by Americans, British, Russians, French and more. 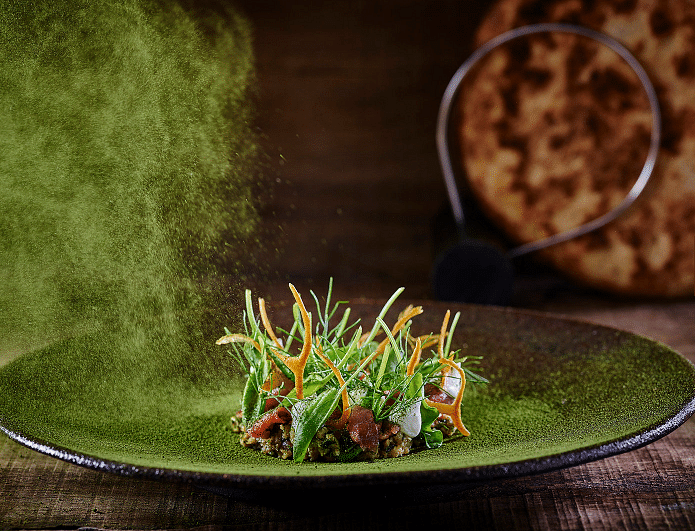 "Modern Israeli cuisine is interesting and exciting and it is happening mainly in Tel Aviv," says Israeli-British chef Yotam Ottolenghi. "But it's a bigger story than that. 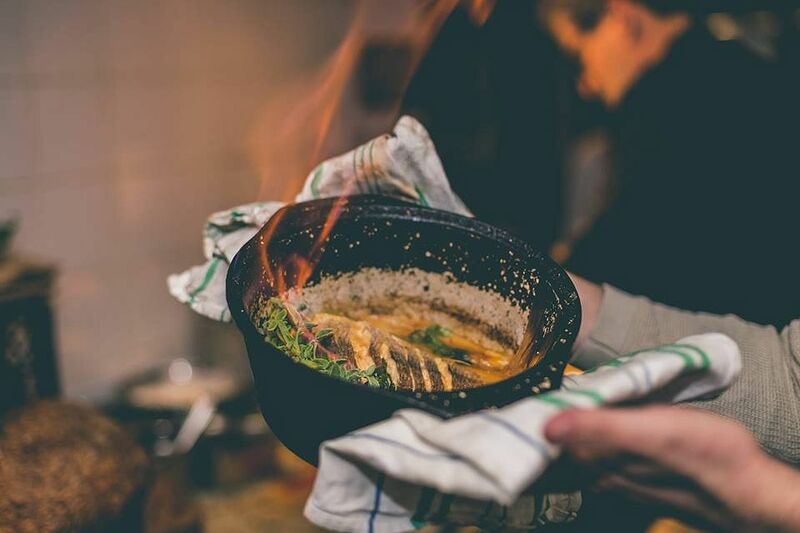 It's also about the interaction between Palestinian cooking and the traditions of the Jewish immigrants, and you can experience that most clearly in restaurants in Jerusalem." Eyal Shani, the TV chef who owns some of the most respected and popular restaurants in Tel Aviv, says the revolution in Israeli food started about 30 years ago, when immigrants started to discover their roots and to explore Arab cooking. "People came to Israel from all around the world but the policy of the government in the beginning was to cut all the memories from Europe and from the Arab countries and to create a new Israel," he says. "So they created a new Israel but they forgot to create a kitchen for the new Israel, nothing to eat. Now, the Israelis are mixing between the (culinary) fashions that are happening all around the world and cooking their own small memories from their grandmothers." During a weeklong visit to Tel Aviv, Jerusalem and Bethlehem last month, I made it to about 25 restaurants. I followed up on recommendations from several people, including Ottolenghi; Jeremy Borrow, head chef at the Palomar, London; and the restaurateur Yair Bekier. I fell in love with Israeli wines as well as the food and with the vibrancy of the restaurant scene. Here are my recommendations. 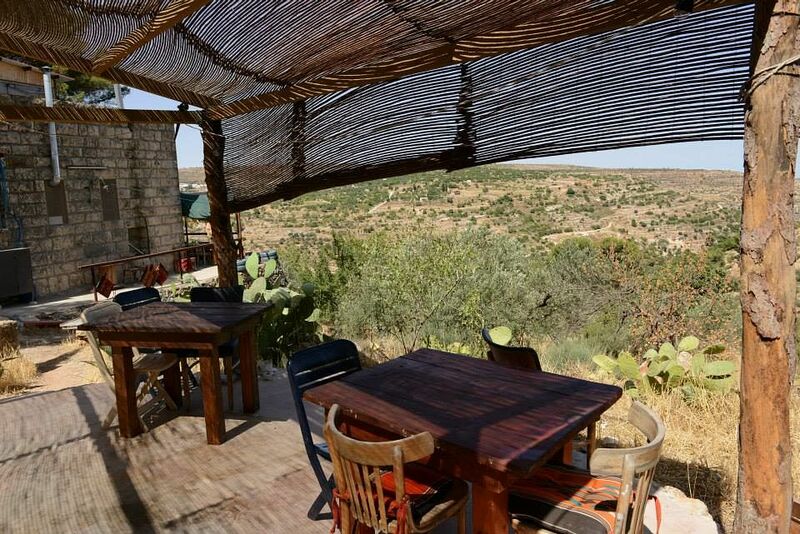 I enjoyed lunch at this isolated organic farm in the hills outside Bethlehem as much as anywhere. It's not so much the food as the ambience, though the food is full of flavour. You eat outside in the countryside enjoying simple dishes such as green almond, dry yogurt, garlic, olive oil and rice beneath the tree on which the almonds grow. This is farm-to-table food at its most immediate. Hosh Jasmin was recommended by Ottolenghi, who says it tells you much about Palestinian agriculture and its connection to cooking. This small restaurant off Manger Square in Jerusalem is a favourite with the Trip Advisor crowd but don't let that put you off. It's loved by Ottolenghi, too. "Afteem is a really good traditional Arabic restaurant with the best falafel and best hummus in the West Bank," he says. I don't have much to add to that. 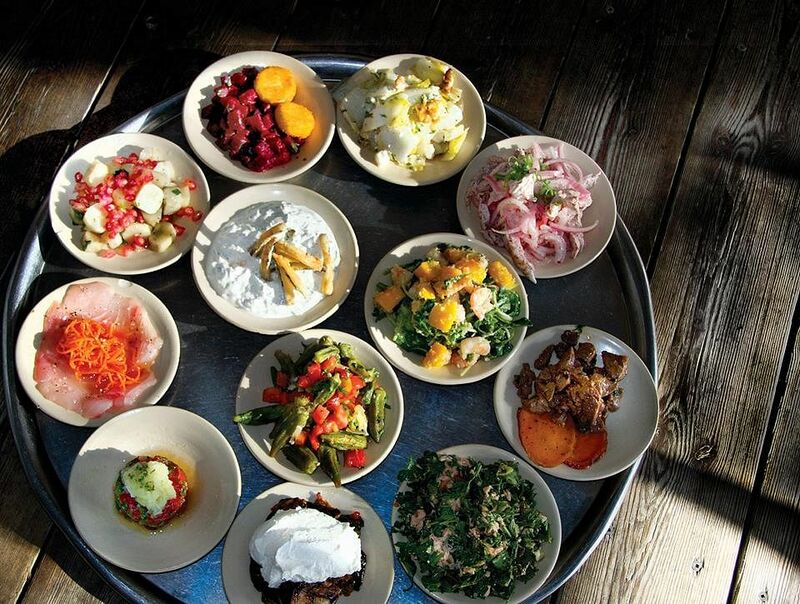 This may be the most acclaimed restaurant in Israel. The music is loud and the chefs can be louder. There's an open kitchen and the most coveted seats are right there at the counter, where you can do shots with the chefs. My photographer politely sipped her vodka throughout the meal. I guess she was working, but so was I. It's full-on food, with starters such as a pan of offal, burnt tomato juice and coriander. Ottolenghi is a fan. "They took the food of the various cultures and gave it a modern incarnation," he says. What most impressed me was the spirit in the kitchen, where chefs high-five and even dance, yet retain a professional focus on what was on the plate. The same group also owns the excellent Palomar and Barbary in London. This unfancy restaurant in Jerusalem's Mahane Yehuda market is a destination for the food crowd. "It tells the story of Jewish immigrants and how their food has manifested itself since grandma's time," Ottolenghi says. The hummus is epic and the signature dish is Turkish eggplant filled with ground beef and pine nuts in a special sauce with cinnamon. Carlos Petrini, founder of the Slow Food movement, is one of the biggest fans, describing Azura as "Jerusalem at a single glance." This local restaurant beside Carmel Market is hopping at night, when young people fill the tables outside, sipping beers and sampling Middle Eastern dishes such as mesabacha-like hummus only made with Jerusalem artichoke and almonds. Most of the ingredients come from the market, and the handwritten menu changes constantly. This is a recommendation of Ottolenghi, who placed it (alongside Abraxas North) among the 101 Best Places to Eat in the World in a poll of chefs. If you are looking for a quiet retreat from Tel Aviv's frenetic nightlife, the Library Bar at The Norman fits the bill. There are comfortable sofas and leather chairs where you can enjoy classic cocktails or creations of the bar team, led by Noy Davidai. The Norman is a fashionable boutique hotel and the bar, which is discreet, with low lighting, feels like a private club. This is a cafe serving meat, right in Carmel Market. It's raw, with bare benches and tables in a plain room where the main decoration is the bloody beef and lamb on show along the counter. The menu is short and the flavours are huge, with freshly baked bread, gorgeous salads and great cuts of meat. M25 looks simple, little more than a market stall, but this is excellent, restaurant-quality food. This looks like a simple bar at Carmel Market but it's a fizzing oasis on a hot day. There are four other locations. Beer Bazaar specialises in craft beers, with local brews on tap as well as bottles by the dozen. There are almost 100 varieties of Israeli beer. It's a friendly place where you may be offered a taste before you quickly succumb to a large glass. This is an old-school restaurant and bar in Tel Aviv where you can sit at a table outside and eat simple food such as Portobello mushroom in a bun with roasted vegetables, feta cheese and fried egg while enjoying a beer or two. It's been around since the early 1990s and is popular with the local crowd. It's always crowded, day and night. Ottolenghi reckons this may be the best restaurant in Tel Aviv. It's owned by Eyal Shami, who changes the menu twice a day. You eat the food directly from the sheet of paper that covers the table, without the intervention of a plate. The dishes are colorful, flavoursome and very messy. The menu is eclectic, with everything from Jericho green beans perfumed with garlic, lemon and olive oil to sugar-coated bananas wrapped in dulce de leche. This seaside restaurant is a lovely place for lunch, if you can get a table on the terrace, which is right on Alma Beach. The food is regional/Mediterranean, with the focus on fish and seafood by chef Ronen Skinezis. You might start with mezze and then have a main such as baked blue bream, seasoned with rosemary and olive oil and served with endive & Jerusalem artichoke flakes. There is a separate vegetarian menu. The food is surprisingly good for such a popular tourist location and the website even features recipes. This contemporary restaurant in the Mendeli Street Hotel is one of the most ambitious I visited. Chef Yossi Shitrit applies modern cooking techniques and ideas to traditional dishes, so that the familiar becomes surprising even before he adds a twist, such as Moroccan spicing. The dining room is filled with the aromas of the region, but the dishes have a focus on presentation, texture and lightness that plays with the classic inspiration. My favourite was red tuna sashimi, wheat salad, coriander, olives and orange. This casual pita counter by chef Shani serves superb and inexpensive food. The pita itself is soft and fluffy, more like a folded pancake than bread, while the meat has great depth. There's amazing roast cauliflower, too, and a banana and chocolate dessert that I couldn't resist. Shani himself was there and people lined up for selfies while we chatted. You don't need to go to one of the three Tel Aviv outlets: Miznon has branches around the world, including in New York and Paris. This popular restaurant is famed for its lively bar as much as for dishes such as half a lobster in fish stock; and fish tartare wrapped in avocado. It's casual and fun and it has been around for more than a decade, when chef Sharon Cohen and his wife, Adi, opened it with just two other cooks and one waitress. This is another Eyal Shani restaurant and one of the hottest in Tel Aviv. It's only open two nights a week and there is no English-language menu. I walked for 40 minutes to reach the place, down a side road and into what looked like an industrial building. It was early and Salon was already hopping. "Come back later and you will see it is really crazy," said Shani, who was right there in the open kitchen behind the counter, which is where the best seats are. The bruschetta with ricotta and peppers was simple but epic. Be ready to party. This is one of the poshest places I ate, in the garden of the Norman. The cuisine is light and Mediterranean, with a range of salads as well as fish and meat off the Josper grill. You can sit outside, shaded from the sun by large umbrellas, drink a glass or two of Israeli chardonnay and enjoy dishes such as organic spring chicken, pink pepper marinade with sage, lemon zest & palm sugar. There are starched tablecloths and gleaming glasses, but the service isn't stiff and the prices-while high-are not too scary. The chicken cost the equivalent of US$24 (S$31.47). This is a great spot for lunch, a haven from more boisterous restaurants. If I'd been organised enough to decide all my priorities in advance, Israel's first 100 per cent vegan Georgian restaurant wouldn't have made the top 100. But Nanuchka is a great place. I loved one dish of khinkali vegan dumplings stuffed with different species of mushroom, with truffle puree, decorated with truffle oil alongside soy yogurt; and another "Pchalli"-seven Georgian salads on a plate. While people argue about the best burger in Tel Aviv, Agadir proclaims that it's among the 10 best in the world. The patties are made from local beef, minced in the kitchen and served on a homemade roll. I sat at an outside table and ordered the bog-standard Junior, costing about US$13 and weighing in at 160 grams along with a beer and enjoyed it so much, I was reluctant to leave half on the plate and head on for two more dinners that night. The centre of the patty was pink and the char was admirable. This bar in the Levinsky Market is another popular Tel Aviv nightspot. The food is simple but inventive. I tried the cheese tortellini, which came with tomatoes and lemongrass butter, fresh shiitake and crispy sage. The dish was excellent: It looked great, the flavours all matched and the varied textures were just right. This is another Ottolenghi recommendation. This fashionable restaurant behind the Great Synagogue has a clay oven at the centre and integrity at its heart. Chef Tomer Agai cooks accessible and enjoyable Mediterranean dishes, such as a labneh ravioli with cherry tomato ragu, white wine; and Lamb Gyrus, Greek-style roasted short rib with tzatziki on roasted pita face up. Santa Katarina is very popular so book early. There are tables outside if you want to escape the crush. I walked for almost an hour along the seafront to reach this modern restaurant above the Shuk HaNamal farmer's market in Tel Aviv port. The beaches were inviting, the seafront architecture less so. No one picked up when I called Kitchen Market to book. When I arrived, I was told it was closed for a private function. So I begged and got in. It was worth the walk and the aggravation. You can taste the freshness of the ingredients, while the view is pretty good, too. This corner taverna near the Levinsky market is packed and buzzing, even at lunchtime. The mainly female kitchen crew turn out bold dishes such as mussels in ouzu. If you can grab a seat at the counter, you may also get to share shots with the chef. Always a plus. This modern brasserie beside the Tel Aviv Museum of Art shows how a good restaurant can complement a museum, just as the Modern does in New York. Chef Hilel Tavakuli's resume includes Le Gavroche and Locanda Locatelli in London. He needs to fill this large venue, which has three separate dining areas, so there are crowd pleasers such as burgers and Caesar salad. But his food is always thoughtful, with intriguing twists such as the Uzbek pomegranate glaze on the seared tuna.